Have you found an online vendor selling Travellers 1 Barrel? A popular rum in Belize. I'd drink it happily if it was all that was available, but not one I'd buy off the shelf. The label design makes it a good gift option if you are bringing a bottle back for the boss! 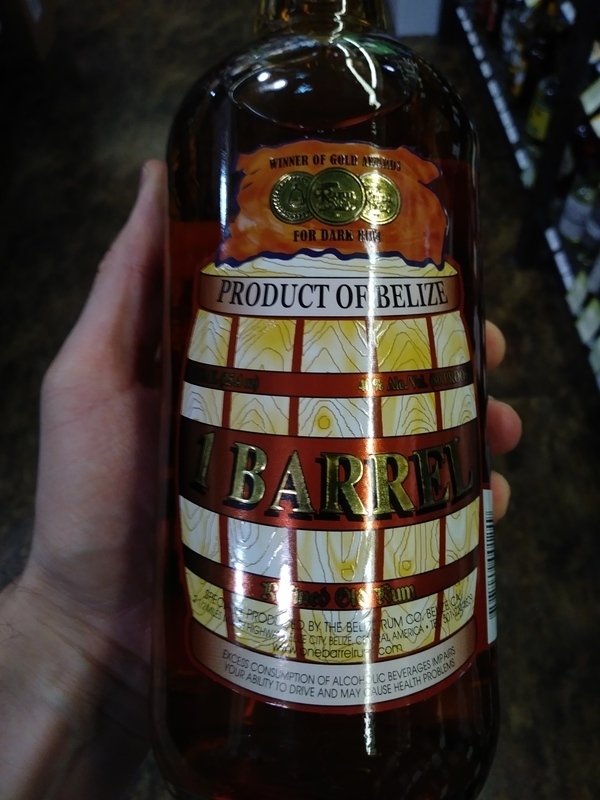 I live only a 90-minute non-stop flight from Belize City, yet I finally found this Belizean rum all the way up in Juneau Alaska last week. Even though it is not highly rated on this site, I still paid $27 plus tax for it in Alaska. As usual, I first try any new rum neat. I was on the fence between rating it as a 6 or a 7. It only had flavors of vanilla and caramel. It had a bit of a burn, but not quite being repulsive as some have stated. Since I had no mixers in my mini-fridge at my motel, I improvised and used ice made from the Juneau Ice Fields via tap water in my room. Pour this rum over pure ice, swish it around a bit, and then strain it a little at a time into a shot glass, and you get one wonderful cold rum drink. Belizean Rum with glacier melt water!! Who could have ever guessed how two worlds combine? I liked that drink a bit too much, which leads to my next point for my rating being no ill after effects. I have been known to dock good tasting rums a point or two for having ill after effects. But in this case, a 6 rating was boosted up to a 7 because of no ill after effects when mixed with glacier melt water. Mixing with ginger ale on the next night not only took away from the flavor, but added some mild ill after effects. Ah-Ha!!! That's it! When sugar is added to a rum either before being bottled or after the fact in mixed drinks, that is when ill after effects occur. This rum does not really taste sweet, but I can almost guarantee that there is no added sugar. I expected to like this rum more than I did, as it was described to me as a sweet gold rum, which sounded good, as most gold rums aren't sweet enough for me. But this kind of let me down. Smells and tastes of toffee and sweet caramel. Very artificial, without much rum flavor. Too young to taste any barrel aging. Has a slight alcohol burn. Not really my kind of rum. This was not great rum, but I will say it is authentic. If you happen to be on a cruise that stops in Belize, you simply have to boost the local economy by taking a city or jungle tour that just happens to stop at The Travellers Distillery. You can’t argue with free samples and you get to experience a taste of the country. I like to think this is as close to the original “moonshine” of rum as it gets, the kind of stuff real pirates of the Caribbean would have longed for. Hey when in Rome! Tried the Travellers 1 Barrel rum at the Travellers Distrillery in Belize City and this is not a neat sipper. I can't believe how some folks like this taste. 1 Barrel is years away from being even slightly enjoyable. It has a very strong alcohol smell and taste and the burn is just awful. Mix it with Coke and move on. Gold colored rum very sweet with a strong caramel flavor. Can be consumed neat or as a mixer. Whennin Belize drink as the Belizeans drink! A very easy to drink tropical flavored rum that is great for mixing. I gave it a 7 because it mixes so well with coconut water. Very refreshing blend. Not bad for the price,. My dad paid $15 for a bottle in belize. Light in color, not much aroma and a bit of an after taste. OK for mixing. A minor difference between my bottle and the bottle pictured here. The top where it reads "Belize Travellers" is replaced with a self-promoted winner of gold awards. It's a light amber color both in the bottle and in the glass. It has a very pleasant fragrance hinting of toffee and caramel. Kind of sweet in flavor but exhibits a bit of oak astringency due to it being a relatively young rum. Allow it to age for a few more years and I expect it would be quite better. Overall a good mixing rum workable in all sorts of cocktails and Coke Zeros but nothing really remarkable about it. This rum is meant to be a mixing level rum, but is able to be enjoyed neat if you wish. This was the popular choice on our vacation. Tasty enough with just a splash of soda water. I would drink it again.